A Modern View: You are now your own prophet, your own religion. You are now your own prophet, your own religion. Of course, you've always known this to be true. Any and all freedom simply is. Let's make this simple - you are your own prophet, your own religious founder. Of course, this probably ruffles someone's feathers somewhere. That's life, after all. Where someone chooses to be ruffled, then so be it. For the most part, I simply choose my life to be ruffle-free. Levenson would call this "hootless." But again, we are a bit ahead of our logic. 1. There are only 2 parts to life: Self and Now. 2. Self + Now = Life. 3. Purpose gives Life meaning. There's your religion. That's makes you a prophet and a founder. If you boil any religion down, you are really left with just those points. Note that government isn't necessarily part of this. Nor is any particular "extreme" belief system. Below this, or before, or senior - is "Just Be." That's your capstone. Or at least the way I see it from here. Your mileage may differ. Probably will, in fact. My job has been to boil all humankind's massive knowledge and wisdom down to just this single blog post. This doesn't negate or diminish anything. You can still believe what you want. No one can take that way from you without your own decision. And you can have it all back just as simply. This above gives you complete freedom from any government or personal oppression being heaped on you at any time - now or in the future. (Future, of course, being a fiction. There is only Now, really.) It also makes you completely responsible for what "happens" to you. Your personal identity is another fiction, there is only Self. (Watch out for those feathers ruffling again...) But we all like to play the game of Individuality. This is a form of purpose, which gives life meaning. Go ahead, play with the logic of this. There is one test to Living: "Does this bring you more Peace?" Some would say, "Does this make your Life simpler?" For peace is also created, but it's a more basic feeling than any of the rest. So you want to change your Now, Self, Life, and Purpose so that you can experience more Peace in your life. Because I'm only here to tell you what I found. I'm just a prophet you can follow or not. You are your own prophet, actually. You are a religion of one. Practically, no two individuals can have exactly the same religion, because believing in individuality means no two people are exactly the same. It's another game we play. But I wanted to share this with you. This gives you a religion you can remember on the five fingers of one hand. Yes, I'm writing this in the early am because I woke from yet another dream, which had this as it's meaning. So my job is to get up out of my warm bed and sit in front of my computer to lay this out for you. Play around with this and you'll see it's probably the most basic statement of "How Things Are" as has been ever stated. Of course, I'm not the first to state this. Jesus the Christ and many other philosophers have mentioned this through and before our histories. All of your efforts will ultimately wind up with you achieving some high state of personal freedom, zen, karma, whatever you want to call it. All I'm telling you here is that you have a choice. That formula above actually describes Immortality. It also can make you insanely rich and happy at the same time. It can and does give you everything you have and anything you could want. That formula also defines all the success routes you could possibly follow. Like that "Law of Attraction" which comes around every century or so. It also means that whatever religious system you are following - Christianity, Judaism, the Koran, Wicca, or being a politician - you're right. All I'm saying is that you can use these five points to improve your quality of living and those around you. You can be free and live in a high state of peace any time you want, for as long as you want. 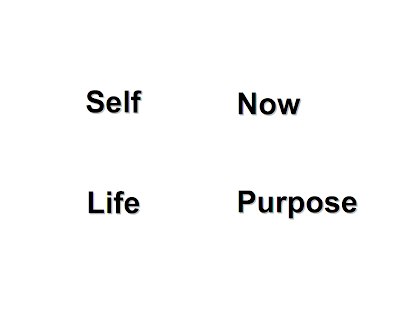 Take any one of those five: Self, Now, Life, Purpose, Peace - and work to improve them. I've told you everything you need to know. As the old phrase goes: The simpler, the better. See you around. I've got a religion to run. And a warm bed to get back to. One more thing: this particular blog post is now in the public domain - use it however you want.